This document defines a U.S. Geological Survey (USGS) digital topographic map. This map product series, named “US Topo,” is modeled on the now historical USGS 7.5-minute (1:24,000 scale) topographic map series produced and printed by the USGS from 1947 to 2006. US Topo maps have the same extent, scale, and general layout as the historical topographic maps. US Topo maps incorporate an orthorectified image (hereinafter referred to as “orthoimage”) and shaded relief image along with a selection of data that were included in the historical 7.5-minute topographic maps. 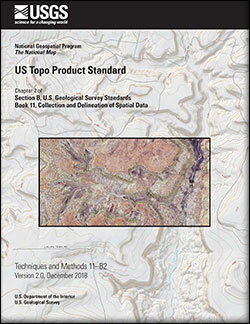 Between June and September of 2017, the USGS transitioned the format of US Topo maps to be published, by using a geospatial extension, in an International Organization for Standardization (ISO) 32000-compliant Adobe® portable document format (PDF) that is called a “geospatial PDF.” Previously, US Topo maps were published, by using geospatial extensions patented by TerraGo® Technologies, in PDF in a format called a “GeoPDF®.” The geospatial PDF design allows a user to zoom in and out in a georeferenced environment, turn layers on and off, view or print any combination of layers, and print any portion of the map at the published scale. US Topo maps are intended to serve conventional map users by providing geographic information system (GIS) information in symbolized form in the customary topographic map layout. The maps are not intended for advanced GIS analysis applications. These products are built on standard coordinate systems and include full U.S. National Grid (USNG) lines, making US Topo maps particularly useful for emergency first-response operations. These maps are also used by traditional topographic map users, such as resource managers, planners, and recreational users who continue to have a need for the symbolized feature data contained in the 7.5-minute quadrangle maps. Full-size style sheet templates in PDF defining the placement of map elements, marginalia, and font sizes and styles accompany this standard. US Topo maps published as geospatial PDFs are fashioned to conform to these style sheets so that a user can print out a map at the 1:24,000, 1:25,000, or 1:20,000 scale using the dimensions of the traditional standard 7.5-minute quadrangle. Symbology and type specifications for feature content and detailed requirements for geospatial content will be published separately. an updated metadata file containing map-specific information.